Summer is just around the corner—and with it comes some time for a restful vacation. 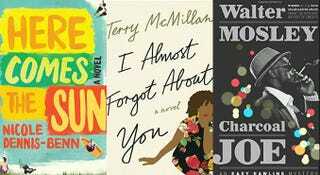 Whether you’re stuck on a crowded flight or relaxing on the beach, here are some stellar books published by black authors during the first half of 2016—just in time to take along with you for some exhilarating summer reading. This formidable, epic novel begins with two African sisters who experience life during the slave trade differently: One is taken as a wife by a white Englishman and remains in Ghana, while the other is sold into slavery to America. The novel follows the descendants of the sisters as they grow up on two different continents over the next 300 years. Beautifully moving and haunting, this is a perfectly rewarding read to dig into during summer vacation. One of the nation’s foremost poets, Rita Dove has received numerous honors, including the Pulitzer Prize for poetry, the National Humanities Medal and the National Medal of Arts. She is also the former poet laureate of the United States. Here, in this collection spanning 30 years of her poems, we have the stunning breadth of Dove’s talent on full display. Terry McMillan delivers another entertaining story of female friendship, love and self-discovery in I Almost Forgot About You. Here, our hero is Dr. Georgia Young, a 54-year-old optometrist who is motivated to sell her practice, travel across country and rediscover her dreams—with a chance at love along the way. A heartwarming story of an individual’s ability to change her life at any age. This stunning debut poetry collection by Ethiopian poet Mahtem Shiferraw sings with the musicality of language, color and imagery. Writes Shiferraw in her poem “Broken Men”: “They want to go back where/once they were kings/and made of palpitating mud/and spit, and air.” Shiferraw, winner of the Sillerman First Book Prize for African Poets, is an incomparable voice in contemporary poetry. In his debut poetry collection, Hum, Jamaal May wowed readers with the force of his visceral, stunning language. Now, in this follow-up effort, he once again delivers. An electrifying read. In her third collection of short stories, accomplished short-story writer Amina Gautier gives us tales that all revolve around the idea of loss—whether the loss be of a person, place, thing or abstract idea. The stories, careful in execution and haunting in their aftermath, will leave the reader breathless. These fantastical tales from the prolific Oyeyemi draw from magical realism but remain grounded in the truth of character and emotion. The stories range from the tale of a baby abandoned outside a church to office politics, from humorous to sad, but all showcase Oyeyemi’s mastery of storytelling and ideas. The first adult novel from National Book Award-winning children’s author Jacqueline Woodson in over 20 years, Another Brooklyn is a haunting, poetic tale of four girls coming of age in the New York City borough. Navigating absent parents, near poverty and sexually predatory men, each girl forges her own path to make a life of her own. It’s hard to believe that it has been 30 years since Walter Mosley introduced us to his famous detective Easy Rawlins. In this latest in addition to the series, Mosley’s talents are in full effect, weaving a tale of suspenseful intrigue that always keeps the reader guessing. An entertaining read from a storyteller at the top of his game. From acclaimed novelist and poet Chris Abani comes a lyrical, meditative memoir. This book, part of a new series by Reckless Books in which authors pen autobiographies grounded in an exploration of their faces, is a profound, moving tale of the formation of self and cultural identity. The third installment of Hall’s addictive Lou Norton series, Trail of Echoes deepens the relationships among Norton, her fellow detectives, friends and family. But the fast-paced storytelling and thrilling suspense that characterize the series are still here in full force. A necessary read for fans of the detective, mystery or thriller genre. Esteemed poet Kwame Dawes joins forces with John Kinsella in a novel experiment: For six months they exchanged lyric emails steeped in the culture that each inhabited—Dawes in Nebraska and Kinsella in Australia. Collected here is their conversation, equally poetic and accessible. A lovely collaboration from two of the most gifted poets of our time. This brilliantly disturbing debut novel from Kaitlyn Greenidge is, on the surface, about two girls whose family is paid by a research institute with a racist past to adopt a chimpanzee and live with it as a member of their family. But as the chimpanzee becomes more beloved by the girls’ mother than her own children, questions of family, identity and race become more complex. Greenidge’s staggering talent deftly builds this heart-wrenching tale.